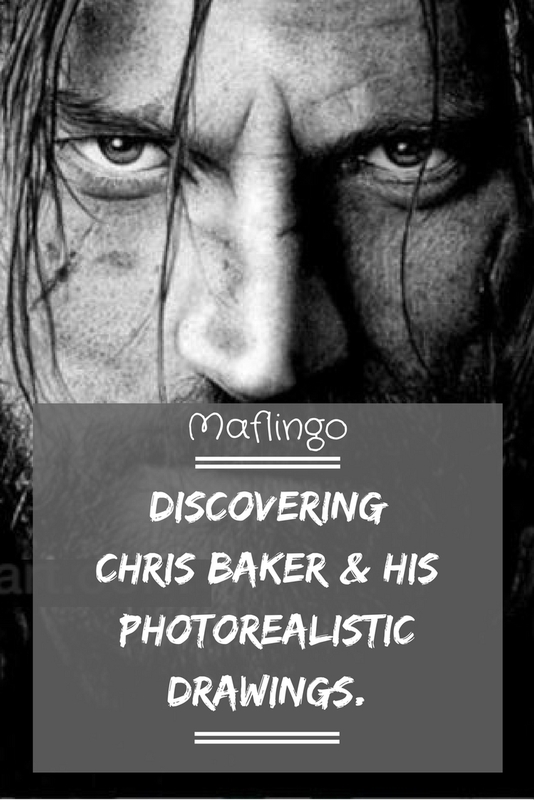 Discovering Chris Baker & his photorealistic drawings, (plus giveaway). 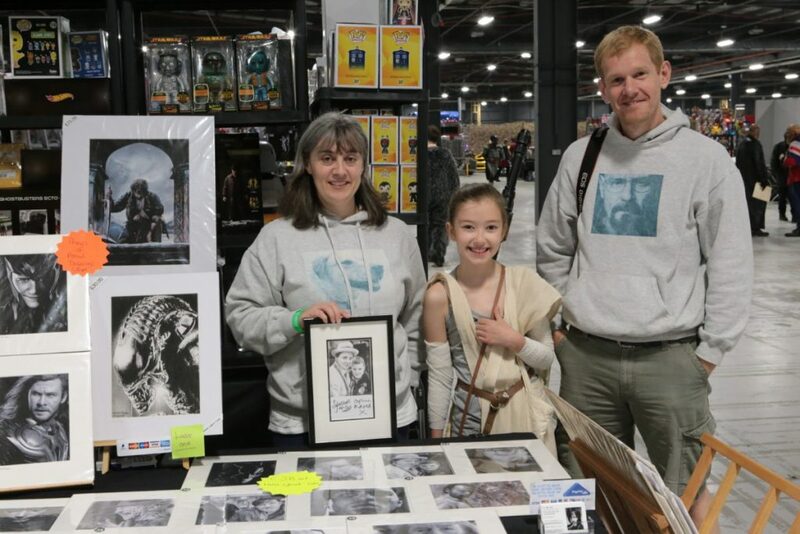 I took Emily to her first convention, The Manchester Film and Comic Con, earlier in the year. You can find out all about it in ‘Star Wars Rey for the day: Emily’s convention adventures’ (HERE). As we drove home after a full day, it wasn’t the guest stars, costumes, autographs or exhibits that stuck in our minds. It was our discovery of the remarkable photorealistic drawings of Chris Baker, a 21-year-old artist from Cardiff, Wales. Emily and Chris’s parents, Sam and Stewart, at Manchester Film and Comic Con, 2016. His parents, Sam and Stewart, were selling his prints at the convention and I couldn’t believe how realistic they were. 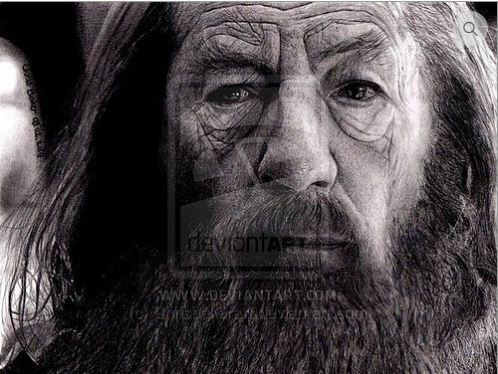 Initially, I thought the prints were photographs but realised they were drawings of characters from well-known films and TV shows including The Lord of the Rings, Game of Thrones, The Walking Dead, Breaking Bad and Marvel/DC superheroes. I’d never seen such realistic drawings, so I was intrigued and ended up having a long chat to Sam and Stewart about Chris and his incredible drawings. The life-changing power of art. 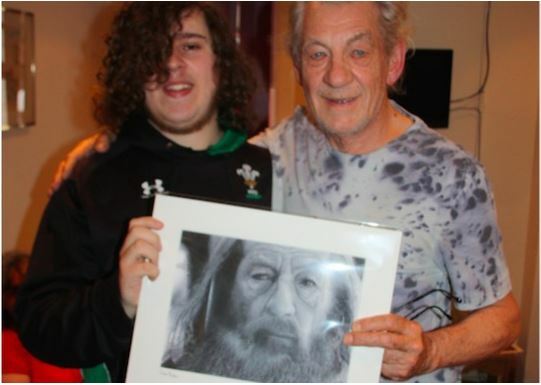 In Chris’s drawing of Sir Ian McKellen as Gandalf, you can see every wrinkle, line and pore. They explained that Chris has Asperger’s Syndrome, (a form of autism), which makes it difficult for him to socialise and interact. In fact, we realised later, he was actually at the convention, but preferred to stay out of sight. His talent for drawing came to light when he was 14 after being taken out of school because of bullying. Since then, art has been therapy for him. Now, with the support of his parents, not only has art given him more confidence but he is earning a living from it too. Chris has his own Youtube channel showcasing his work. His videos show time-lapse footage of how he creates his photorealistic images. I am unable to embed the videos in this post, so visit the Chris Baker Art’s Youtube channel: HERE. Chris Baker Art in the news. In the last 12 months, Chris’s talent has been picked up by national news programmes with his mum and dad appearing on Good Morning Britain. Chris’s parents interviewed about his work on Good Morning Britain. I think you’ll agree, Chris has a remarkable talent and his drawings look like photographs. Coming soon: Creative Inspirations – Chris Baker Art. Have you heard of Chris Baker and his art? What do you think of his story and his artwork? Who would you like Chris to draw next? Win an A4 Chris Baker Giclee print. Chris is kindly offering one of my readers the chance to win one of his A4 Glycee prints. Even better, the winner can choose their print from his online collection (excludes Michael Van Gerwen prints). 1. There is one Chris Baker A4 giclee print available for one winner. 2. This prize draw will be drawn at random, and is open to entrants aged 18 or over residing in the UK. 3. Up to 6 entries per person. All are compulsory methods of entry. 4. Maflingo.com retains the right to change the competition if necessary. 5. The prize is not transferable and there is no cash alternative. 6. If the winners do not contact me within one week, I will redraw another winner at random. 7. Entries must be received by 11.59 pm on 13th October 2016. 8. The winners will be chosen at random and notified by email on 14th October 2016. This giveaway is posted on the Loquax website. Follow me on Facebook, Twitter, Pinterest and Instagram using the social media buttons on the top of this page for updates between posts. Creative Inspirations: Mike Matola, LineByLinePosters. 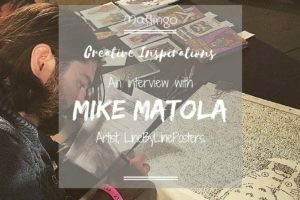 In part 1 of my new series, Creative Inspirations, where I showcase artists and creatives that inspire me, I interview Mike Matola, the creator of LineByLinePosters. Find out about the man behind these wonderful portraits, including my favourite 'Totoro' print. Hurry! Marvel-lous bargain for superhero fans! Hurry! 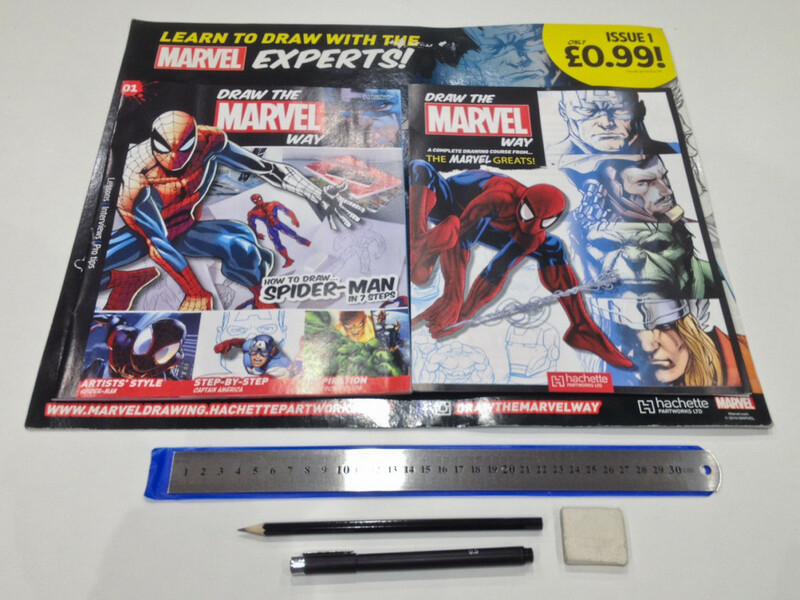 Buy Issue 1 of 'Draw the Marvel Way'and learn how to draw Spiderman PLUS get a metal ruler, eraser, pencil and 0.5mm finepoint drawing pen all for only 99p. 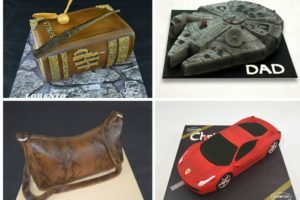 Creative Inspirations: Cardiff cake makers, ‘Scrumptons Cakes’. In part 3 of my 'Creative Inspirations' series, where I showcase artists and creatives that inspire me, I interview Anne Yewlett, who runs the Cardiff cake makers, Scrumptons Cakes, with her husband Dan. I discovered Scrumptons Cakes whilst on holiday in Wales and I've been desperate to share Anne and Dan's story and talent ever since! I think Chris should draw himself. He is a very gifted man and a self portrait would be very fitting. I would love him to draw Prince George and Princess Charlotte. After seeing them on the news this week, I think they are adorable. It would be lovely to have a print of Prince George especially that could be passed down in the family so that when he eventually becomes king one day, it will be a piece to be treasured! I would love him to draw Lisbeth from The Girl with the Dragon Tattoo. She has such striking features, I think he would do it great justice. Susan Boyle, she is a great singer. She has shown that Disabled individuals can have value, skills etc. As she has a wonderful voice. She has shared her story of her upbringing, family life etc and stays with her feet firmly on the ground. Living in her home town where she was brought up she is Susan Boyle, just as she has always been. Now known for the talent that she has :- a beautiful singing voice. She seems down to earth, pleasant and can be cheery. She has shared her diagnosis of Aspergers which may benefit others in understanding such a disability. Hopefully this type of behaviour will assist in understanding, accepting and supporting individuals who happen to have a disability etc. It would be great if Chris could draw someone who in a lot of ways is just as inspirational as himself – Katie Piper. A beautiful lady – inside and out – who suffered an horrific facial scarring attack but chose not to become a victim and hide but to come out fighting to raise awareness for people like herself who suffer from physical disfigurement in one form or another rhrough no fault of their own. I think a portrait of her by Chris would be striking, intense and memorable…and do a lot of good. Mother Teresa because her face told a story. What an inspirational and talented young man. It is lovely that he has found an outlet for his talent. These are amazing, what a talent! I think Ripley from Alien, there’s a few emotive scenes that he could capture! I want him to draw sooooo many of my favourites. I’m so pleased you popped over! Good luck in the competition! Thanks for popping across, Lynne and for your lovely comment. I think his next subject should be the actor Mark Rylance, I think Chris would be excellent at capturing Rylance’s interesting soulful look. I would want him to draw a picture of my kitty. I would absolutely love to have that! Amazing work. Not just because of the likeness that he captures, but the poses he chooses exemplify each character. I think he should draw Mark Rylance as the BFG. Sir David Attenborough – Legend!